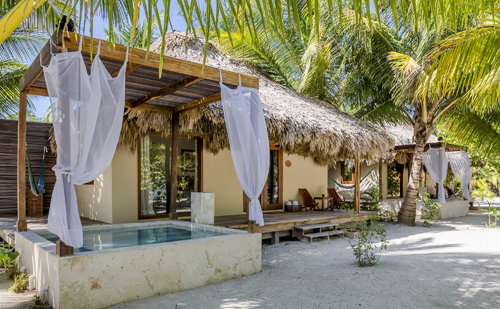 El Secreto is an intimate, modern tropical-style resort located on Ambergris Caye, 11 miles north San Pedro Town. With only 13 luxuriously-appointed, free-standing thatched roof villas, enjoy the feeling of being on a secluded island oasis tucked away within the resort’s own private beachfront enclave. 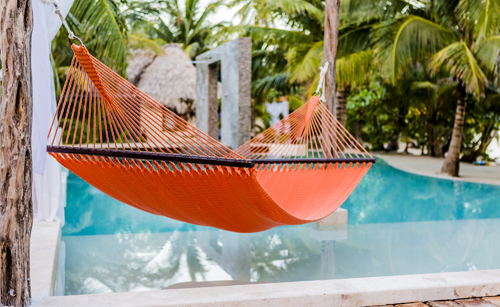 With careful attention given to every detail of design and service, while remaining eco-sensitive and true to the region’s authenticity and culture, El Secreto combines the exotic style of the South Pacific with the relaxed-nature of the Caribbean. The IKAL Spa Villa features a private double massage cabin, steam room, indoor/outdoor Jacuzzi, and a fresh water pool. Spa services are provided in the spa villa, throughout the property’s beach cabanas, and at either of two thatched roof spa towers – featuring Thalmer & Fisiosphere products and an extensive menu of facial and full body treatments. Dining options at El Secreto are designed to promote overall health and wellness, offering a regionally-inspired menu of culinary fare using organic ingredients grown at the resort’s own vegetable and herb gardens. A series of complimentary resort amenities are available on a daily basis, including continental breakfast, yoga and meditation sessions on the resort’s private pier, bicycle rentals, non-motorized water sports including sailing and kayaking and shuttle boat service to/from San Pedro Town. 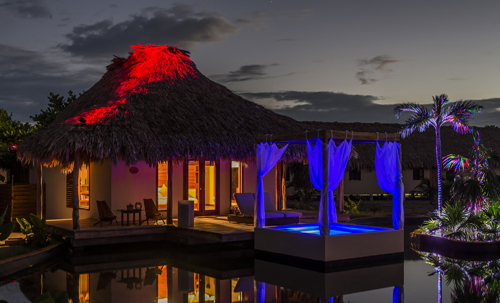 El Secreto is located 11 miles north of San Pedro town on Ambergris Caye. Upon arrival to San Pedro Town, the experience begins as you are greeted and transported to the property via private 30-minute boat ride, before being warmly welcomed at the private pier with a signature cocktail and chilled scented towel. Throughout your stay, enjoy the pampering with complimentary fruit, five-minute power massages and specially-prepared drinks made to order with hand-picked coconuts from the resort’s surrounding palms. For the tech-savvy traveler, an “intelligent” in-room system allows guests to control the villa’s air conditioning and lighting to their own preferred settings using their iPad or iPhone. Within each of the resort’s villas, you can find your own private escape. Three Sea Villas are located just steps from the ocean, four Tropical Villas offer lush garden views and five Lake Villas surround the resort’s salt water lake. 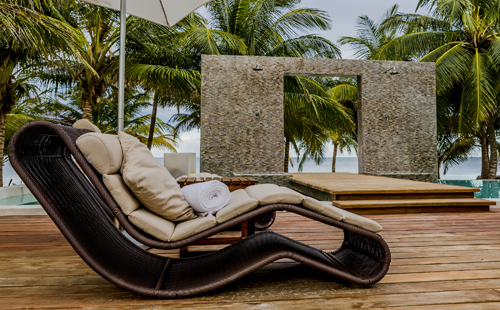 All villas feature indoor hot tubs, private outdoor Jacuzzis, outdoor showers, outdoor decks with hammocks and contemporary and locally-inspired fixtures with all carpentry designed and handcrafted by local artisans using a variety of hard woods native to the region. The most exclusive villa of the resort, the Spa Villa is located along the beach line with spectacular views of the ocean, where you can indulge in relaxation and comfort while you enjoy your own private steam room and couples massage cabin with glass doors that lead you to your own private infinity pool. 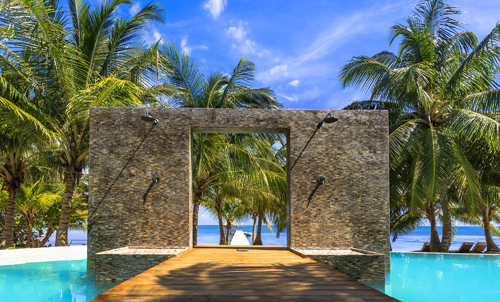 Dotted along the white sand beach line there are 3 Sea Villas located just steps to the water, where you can feel the breeze while you enjoy beautiful views of the ocean. The 5 Lake Villas are scattered around a beautiful saltwater lake that gives these villas an amazing setting. With private wooden docks right over the water, enjoy lounging in the morning sun, watch the sunsets to the west in the afternoon and stargaze all night long. The 4 Tropical Villas are set amongst the lush tropical gardens, a perfect place for spotting wildlife and a wide array of birds. Set under a giant palapa, the restaurant at El Secreto is open for breakfast, lunch and dinner, offering a regionally-inspired menu of culinary fare using organic ingredients grown at the resort’s own vegetable and herb gardens. Becoming fast favorites among guests are the Mahi Mahi Ceviche, a variety of scallops, salmon and beef Carpaccio options, the locally-inspired Curried Shrimp, and a divine Lobster Bisque. The resort’s poolside Sand Bar provides an alternative food and beverage option for lunch and light appetizers. If you have the energy to leave the wonderful surroundings, take the complimentary resort bikes on a short journey north to AB’s favourite spot on the entire island, Tranquility Bay. The laid back colourful wooden bar is adorned with marine mosaics, the staff are welcoming and friendly and the restaurant serves simple lunch fare. Be sure to take a dip in the azul waters directly under the bar and wade out with your snorkel to the coral, close to shore, for some of the best snorkelling on the island. Prices are listed in US dollars. Continental breakfast is included in all room rates. Rates are based on double occupancy and do not include an additional 9% Government Tax and 10% Service Charge. Transfers to/from San Pedro cost $50 US + 22.5% taxes per person, round tip. The complimentary transfer will be only provided for stays of 3 nights and over. 1 Child 12 and under for free in parent’s villa.